Here's a recent painting of Sunflowers done from life. Each time I set out to paint Sunflowers I think they will be easy since they seem like large simple shapes, but they are very challenging to paint. 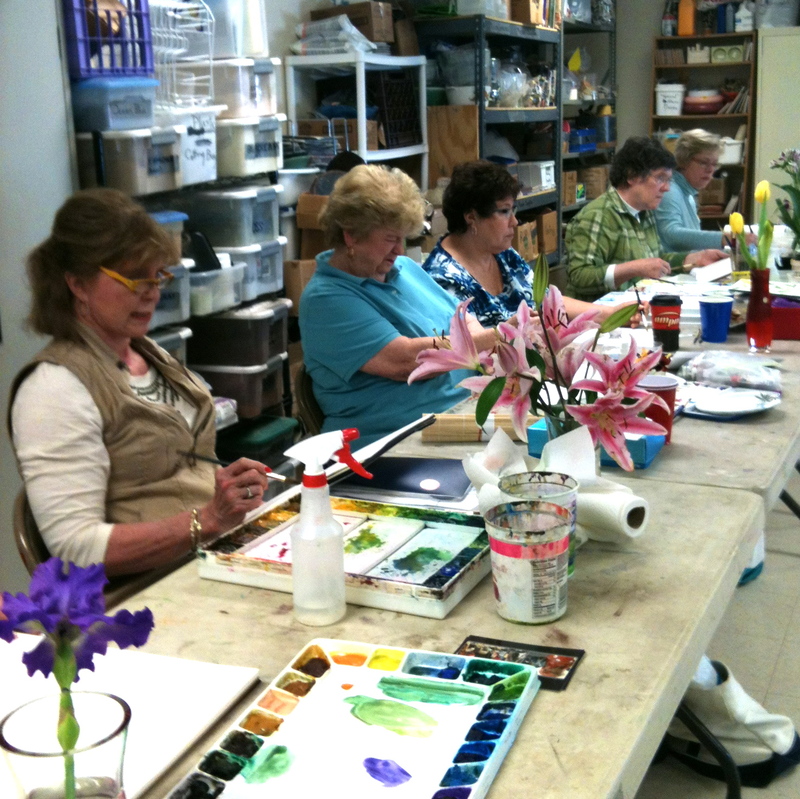 When I teach my flower painting classes, I often have a special topic on white and yellow flowers since they are often the trickiest to capture. Here's the companion piece to my last post. 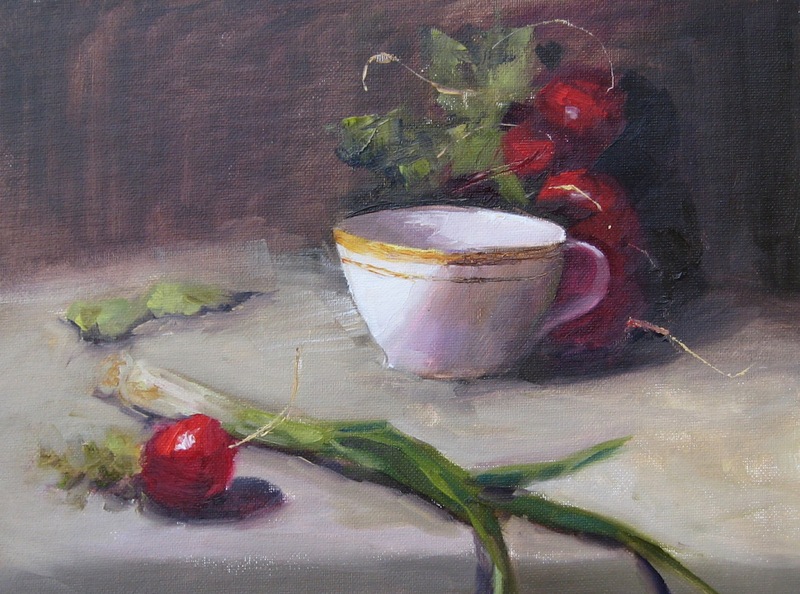 This one was based on a still life set up I did for a demo. 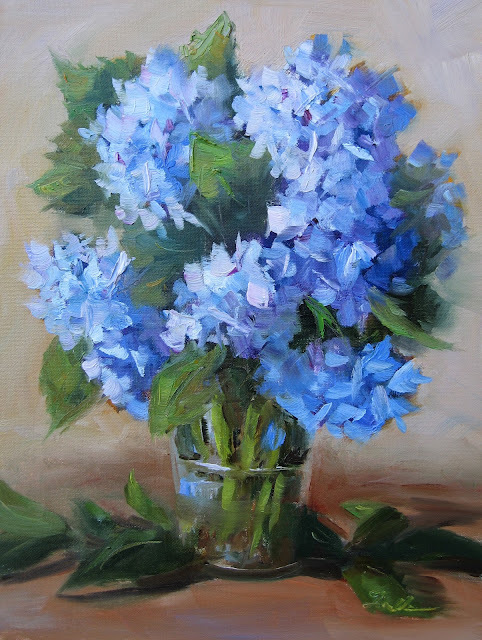 I love the analogous palette of blues, violet and kind of a periwinkle that this combination of flowers offers. Love painting hydrangeas. It's an opportunity for especially fun brushwork and some of my favorite colors. In Italy, people seems to find places to add beautiful flowers even if they only have a small place to plant. This painting was inspired by a window in Tuscany where the resident had filled their space with colorful flowers. I'm headed back to Tuscany this fall to teach another workshop. I've been teaching there for 5 years, but this is the first time I'm going in the fall so looking forward to seeing Tuscany and the vineyards in another season. It's great to be there for a week painting live, but another side benefit is an opportunity to take lots of amazing photo's for reference for painting to keep the experience alive when I get back home. If interested in joining me, feel free to get in touch with me at patfiorello.com. Or click on pdf flyer for details. 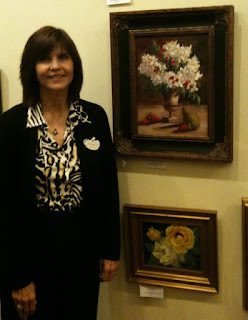 This painting was another demonstration I did at my recent workshop "Painting Flowers Ala Prima in Oil". My students were surprised how dark I started out the ginger jar to get form, light & shadow, but in the end it still appeared as a white jar. A simple study of a rose, teacup and glass bottle with reflections. Over the weekend, I just completed and released my "new and improved" website. I have had a website since I began my journey as a professional artist in 2002. Because I teach, I have been pretty good about updating it frequently to add current workshops, news and images, but over time it's easy to have your site be like a closet where you just keep shoving more stuff in. I did revamp the look about five years ago when I started painting in oils in addition to watercolors, but have just been making incremental changes since then. Over the last couple of years, I have really done a lot of work on my art in terms of both developing my skills and clarifying in my own mind what I want to paint and how I want to paint. 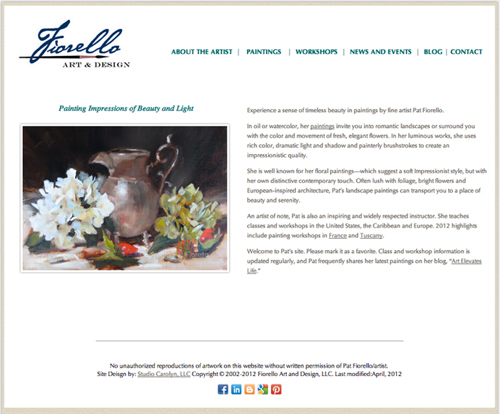 So I thought it was time for a total refresh of my site to reflect where I am today as an artist. Working with my wonderful webmaster Carolyn Majewski, who has been with me from the very beginning in 2002 and who does an amazing job, we basically stepped back and did the whole thing from scratch keeping in mind what I wanted to communicate about my art. I also took the opportunity to rewrite my artist statement and bio with the help of friend, writer and fellow artist Judith Schonbak. This was probably the hardest and most time- consuming part, to try to distill down everything I wanted to say about why, how and what I paint into a few short paragraphs. But it was very satisfying to come up with something that reflects where I am today and feels authentic about what I want to express. Selecting the paintings was also a challenge. On one hand, I see some sites that post every painting that is available, but often they feel cluttered, so I chose instead to have fewer representative examples as a showcase of my work. 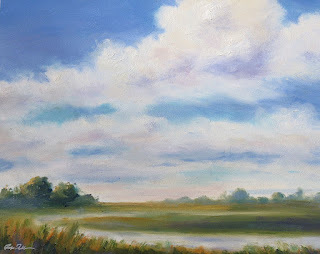 Instead of grouping by subject matter, regardless of medium (I used to have 5 categories), paintings are now separated into oil and watercolors in two groupings of subject matter- landscapes and florals. Of course that means I couldn't have all of my favorites. Over time I'll have to be disciplined, if I add one, I probably need to take one away (kind of like that closet analogy again). While it's not something I think you need to do every year, as you grow as an artist and move in new directions, it is important to keep your communication to the public consistent with that direction. It's easy to have the incremental drift and wake up a few years later seeing that what you are communicating is where you were not where you are now. If you have a moment, please take a look and let me know what you think. I promised I would post the finished painting from the photo I shared in my last post on Wednesday. Here is it .You can see I used a bit of artistic license to reformat the overall shape of the bouquet to fit a rectangular canvas panel. I could have done it as a square, but I really like the trailing vine on the right and wanted to have enough space to include it. 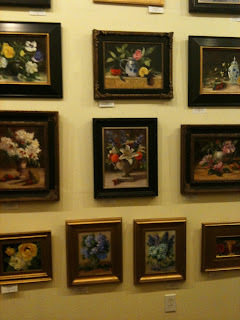 The white flowers in the back were the most fun and it may be hard to see in this small photo of the painting, but the flowers give that translucent feel that they have in real life. Painting is magic- it continues to amaze me how you can place shapes of color next to one another in a certain way and give the illusion of something real. An easy concept to understand, yet a lifetime of study to master. In case you missed the photo from the last post here was the inspiration. Any time is a great time to paint flowers, but spring is especially fun when there is an abundance of color readily available in the garden. 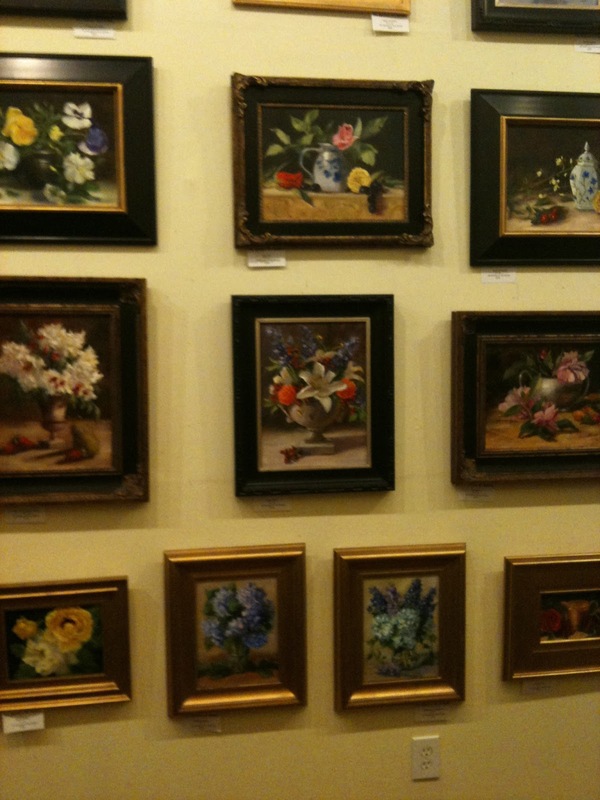 These beautiful flowers are from the garden of one of my painting students Barbara Wideman. She brought them in to a recent painting class and gave me permission to use the photo. I did a painting of them today. Almost finished . Will share that in the next post. 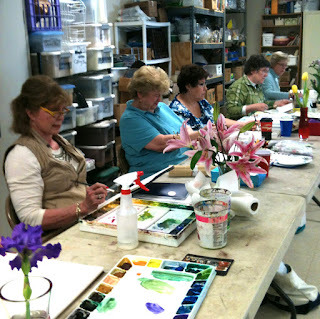 "Painting Flowers : Loose, Fresh & Easy" class which I teach in Dunwoody, GA. Yesterday was the first day of the spring semester. The morning class sold out and we had a long waiting list, so we added another session in the afternoon. It was a full day with 24 students across the 2 sessions. Was especially nice to have a room full of eager students and their beautiful flowers. (with no preliminary drawing). It was out of the comfort zone for some people- but I hope it was freeing and fun to make shapes with the brush rather than be tempted to "color in" a tight drawing. I was in Charleston last week. 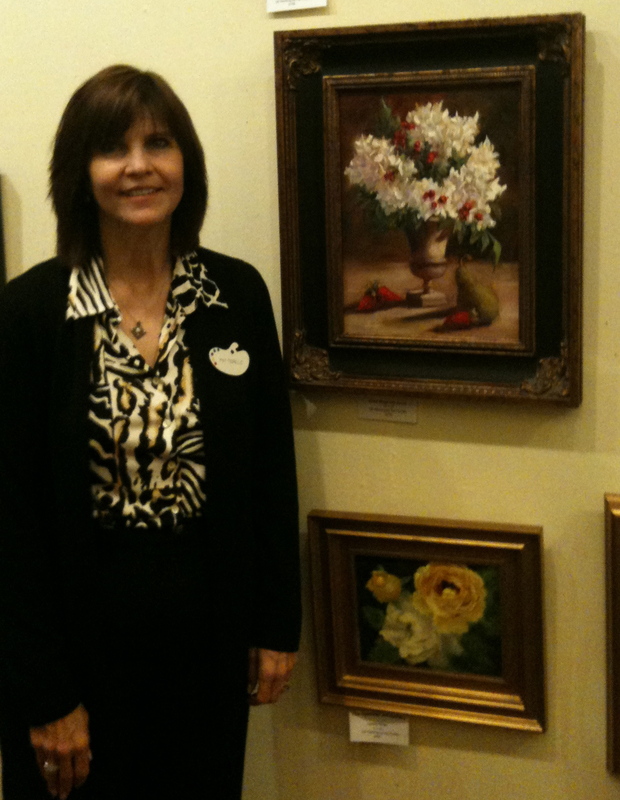 Delivered 15 new paintings for the opening of my show " In Full Bloom" a series of elegant florals. Here are a couple of photo's from the show. While in Charleston, I was able to go on one of their Spring walking tours of private gardens and really enjoyed that. They have been running the Festival of Houses & Gardens, which benefits the Historic Charleston Society, for 65 years. This year's program ran for a full month and included daily events which typically include 8-12 homes or gardens. They have 15 different programs over the course of the month. It's amazing job to coordinate all that, but they do a great job and it is well worth going if you ever have the chance. Very inspiring to see what people do with relatively small garden spaces to make them seem lush, romantic and inviting. Came back inspired to make some changes in my own backyard garden. This is a painting I did a couple of years back while I was working on a whole series of "Cloudscapes", but I thought it seemed fitting for today's topic. "Art as Worship". That refers to a radio broadcast sponsored by author Vanessa Lowry, who hosts a weekly show by the same name where she interviews all types of artists( visual, musicians, writers, sculptors etc..) and explores the connection between art & spirituality. I was recently interviewed by Vanessa and that will be available tomorrow April 4 at 9AM EST on Empower Radio. If you are available at the air time tomorrow, you can click the "Listen Live" button at the top of the Empower Radio page as the show airs. After that, my interview will archived on that page so you can listen at your convenience if interested. Vanessa wrote several books including "30 Days of Gratitude" , a collection of daily gratitude exercises available at www.DaysofGratitude.com. It is available as a free downloadable book so that's one more thing to be grateful for. Hope your day is filled with appreciation, connection and creation! 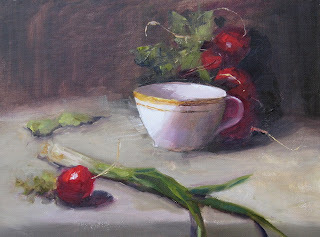 Here's another study I did at the Laura Robb workshop last week. Simple subject, but good practice in depicting form and depth.